in honor of Paul Ogne. Primary texts about the Herod's Reign of Terror from (Rutgers University Dept of Religion) Mahlon H. Smith's Into His Own: Perspective on the World of Jesus companion to the historical study of Christian texts. "Of David's Lineage," The Jesus Database, an online annotated inventory of the traditions concerning the life and teachings of Jesus. Dr. Gregory C. Jenks, FaithFutures Foundation. Sermon XXXI, Sermon XXXIII, Sermon XXXIV, and Sermon XXXVI On the Feast of the Epiphany by Leo the Great (400-461). A Sermon for the Epiphany, Matthew 2:1-12, Martin Luther, c. 1522. Commentary on a Harmony of the Evangelists, John Calvin, 1558: Matthew 2:1-6, Matthew 2:7-12. "[Herod] Was much moved, for he was a foreigner, and became ruler by force; and the Jews were troubled; for wickedness is mad and raging." "Those who live at the greatest distance from the means of grace often use most diligence, and learn to know the most of Christ and his salvation. But no curious arts, or mere human learning, can direct men unto him." "Wise men - The first fruits of the Gentiles. Probably they were Gentile philosophers, who, through the Divine assistance, had improved their knowledge of nature, as a means of leading to the knowledge of the one true God. Nor is it unreasonable to suppose, that God had favoured them with some extraordinary revelations of himself, as he did Melchisedec, Job, and several others, who were not of the family of Abraham; to which he never intended absolutely to confine his favours. The title given them in the original was anciently given to all philosophers, or men of learning; those particularly who were curious in examining the works of nature, and observing the motions of the heavenly bodies." "That the gold was presented to the infant King in token of His royalty; the frankincense in token of His divinity, and the myrrh, of His sufferings; or that they were designed to express His divine and human natures; or that the prophetical, priestly, and kingly offices of Christ are to be seen in these gifts; or that they were the offerings of three individuals respectively, each of them kings, the very names of whom tradition has handed down--all these are, at the best, precarious suppositions." "The providence of God is seen in these gifts. It provided the means necessary for the flight to Egypt that was to follow at once, and to sustain the holy family in a foreign land." Commentary, Matthew 2:1-12, Niveen Sarras, Preaching This Week, WorkingPreacher.org, 2019. "TThe image of the wise men on the Christmas cards is different than what we have in the Bible." Living by the Word, David Keck, The Christian Century, 2019. "The wise men remind us that stargazing always involves politics." "The Gifts We Give," Amy Lindeman Allen, Political Theology, 2019. "The season of epiphany moves us from a season of indulgence, to a season marked by gift giving that honors God. What kinds of gifts do we give? And how do these gifts honor God by honoring the dignity and agency all of God’s children?" A Provocation, Richard Swanson, Provoking the Gospel, 2019. "Why does Matthew’s storyteller have these strangers from the east enter his story with gifts?" "The Story Continues: On Dreams and Celebrated Births and Following Hope Where It Leads," Janet H Hunt, Dancing with the Word, 2019. "And oh, what would it have meant for us to feel the tremors in the earth beneath our feet to know that Herod had his sites on this beloved child and that countless others would suffer and die as a result?" "Wisdom comes in many guises." "The Light of God's Liberation," Caleb Tabor, Modern Metanoia, 2019. "The story of the Magi and the Epiphany is a message of warning to those who are trying to stop the flow of God’s gracious and liberating work in the world; you can do whatever you want, pull any strings you want, commit any atrocity you want, but you will not win." "Song of Hope," Alan Brehm, The Waking Dreamer. "We celebrate Epiphany because it's a time to remind ourselves that in him a light has dawned that will never go out; a light of faith, and hope, and joy that shines in all the kinds of darkness that can afflict this world." "Jesus, Herod, the Magi and Us," Commented Bible Passages from Taize, 2012. Commentary, Matthew 2:1-12, Stephen Hultgren, Preaching This Week, WorkingPreacher.org, 2015. "The word used for the “East” in the story, anatolai (plural)/anatole (singular), really means 'the rising,' that is, the rising of the sun (our word 'orient' comes from a Latin word with the same meaning: oriens).."
Evangelio Comentario del San Mateo 2:1-12 por Neddy Astudillo, Working Preacher, 2015. Los Sabios del Oriente: Un Acercamiento Eco-teológico. "The Child King Messiah Shepherd Child," D. Mark Davis, Left Behind and Loving It, 2013. "Hearing that a 'child king of the Jews' is being born, Herod inquires among the religious scholars where 'the Christ' is being born. It is Herod, in this story, who makes the connection between a child king and the Christ." "Epiphany - The First Baby Shower," Robb McCoy, The Fat Pastor, 2014. "To a modern reader, the gifts of the Magi seem strange and impractical. To explain these peculiar gifts, many have placed dubious symbolic meanings on them. Instead, I feel it much more likely that these gifts were extremely practical." Commentary, Matthew 2:1-12, Craig A. Satterlee, Preaching This Week, WorkingPreacher.org, 2013. "The great celebration of the Incarnation, according to Paul, flows into the great celebration of the church." "The Wise Man," Frederick Buechner, Buechner Blog. "Herod the Great," from Peculiar Treasures. "And now, brothers, I will ask you a terrible question, and God knows I ask it also of myself. Is the truth beyond all truths, beyond the stars, just this: that to live without him is the real death, that to die with him is the only life?" "America's Infanticide: No Cheap Comfort," Epiphany, Dan Clendenin, The Journey with Jesus, 2013. "Sentimentality is one of the greatest enemies of the gospel." "An 'Adults Only' Nativity Story," David Lose, WorkingPreacher, 2013. "And that is what is at the heart of Matthew’s darker, more adult-oriented story of Jesus’ birth: the promise that is precisely this world that God came to, this people so mastered by fear that we often do the unthinkable to each other and ourselves that God loves, this gaping need that we have and bear that God remedies." "Stars and Prophets in Alignment," D Mark Davis, raw translation and exegesis/questions, Left Behind and Loving It, 2013. "Frankincense, Myrrh and a Toothbrush?" Lisa Nichols Hickman, ON Scripture, Odyssey Networks, 2013. "The Madness of King Herod," MaryAnn McKibben Dana, The Hardest Question, 2013. "What fortresses do we need to demolish for the sake of the kingdom that Christ came to inaugurate?" "Bright Star Rising," Nancy Rockwell, Bite in the Apple, 2013. "Herod is still sending centurions to trample through small towns in the name of the public good." "Gold, Frankincense and Myrhh," Alyce McKenzie, Edgy Exegesis, 2013.
" The Star," sermon starters compiled by Lisa Ann Moss Degrenia, 2013. "See It; Share It," Christopher Burkett, Preacher Rhetorica, 2013.
" How do you share an enthusiasm? I mean share something that really stirs you, heart and soul, with someone who doesn’t share your keenness?" "On Magi and Journeys," the Rev. Dr. Janet H. Hunt, Dancing with the Word, 2013. "Have you ever known yourself called on such a pilgrimage? What was its outcome? How were you changed?" Holy Textures, Understanding the Bible in its own time and in ours, Matthew 2:1-12, David Ewart, 2013. "That this comet is understood to be a sign of the birth of a "child who has been born King of the Jews" is particularly frightening to Herod since HE is King of the Jews and this unknown child is a threat to him and his heirs." "Epiphany, one way or another," Michael Coffey, 2013. Comentario del Evangelio por Iris Barrientos, Mateo 2:1-12, Working Preacher, 2013. "Where Is The Child?" Peter Lockhart, A Different Heresy, 2013. Visit of the Wise Men, audio telling, story in episodes, graphic, audio and written commentaries. Go Tell Communications, Biblical Storytelling for the Global Village, 2012. "Find that Child," Caspar Green, Scarlet Letter Bible, 2011. "Find that child, and you’ll have found the key to a whole new world." "Was Jesus Born in a Stable?" podcast by Mark Goodacre, NT Pod, 2011. "The Festival of Epiphany," pdf study guide, Robert B. Kruschwitz, (other resources at) "Christmas and Epiphany Library," Christian Reflection, The Center for Christian Ethics at Baylor University, 2011. Focus articles: "Distinctive Traditions of Epiphany," by Amber and John Inscore Essick, "A Feast Worthy of Devout Celebration," by Michael J. Clingenpeel. Commentary, Matthew 2:1-12, Mark Allan Powell, Preaching This Week, WorkingPreacher.org, 2008. "The story of the magi foreshadows later developments in Matthew's narrative. Even in infancy Jesus inspires both worship and hostility, responses that are repeated throughout the story." Commentary, Matthew 2:1-12; Galatians 3:23-38, Regina Langley, The African American Lectionary, 2009. "The epiphany of Christ and our baptism in him is the death-nail on the head of a death-dealing kingdom and the ushering in of a new kingdom." "Disturbing Tourists," Peter Woods, I Am Listening, 2010. "The mystical magi are knocking on the door. They speak of stars and destiny, and shepherd kings who can lead us to God. Will we allow them to disturb us enough that we might join their caravan of change?" "Pagan Magi and Power Politics: The 'Disclosure' of Epiphany," The Journey with Jesus: Notes to Myself, Daniel B. Clendenin, Journey with Jesus Foundation, 2008. "All these Herods do the opposite of the magi; they work hard to make the subversive kingdom of Jesus subservient to the political power of the state. But these Herods, whether ancient or modern, are right about one thing; if Jesus is Lord, then Caesar is decidedly not lord." "First Thoughts on Gospel Passages in the Lectionary: Epiphany," William Loader, Murdoch University, Uniting Church in Australia. "The more immediate allusion, however, is to the prophecy of Balaam, who refused to cower to the murderous intentions of the evil king Balak towards Israel, prophesying instead that a star would arise from Jacob, a sceptre from Israel (Numbers 24:17; a passage applied messianically also in the Dead Sea Scrolls and the Testaments of the 12 Patriarchs)." "The Wisemen," Gospel Analysis, Sermons from Seattle, Pastor Edward F. Markquart, Grace Lutheran Church, Seattle, Washington. Detailed background and exegesis. "Seeking," Listening to the Text, Engaging the Text, and Preaching the Text, Dr. Dwight Gunter, Preacher's Magazine, 2007. "This story calls for a response on our part. Therefore, the message pointed to our choices." "I think that this text raises two very important questions for us today: 'Where are the unchurched at today?' And 'What signs will speak to them?'" "Five Things You Didn't know about the Magi," Brent Landau, Patheos, 2010. "The Epiphany of Our Lord: Matthew 2:1-12," Revelation and Response: Matthean Texts for Christmas and Epiphany, Carol Mork, Word & World: Theology for Christian Ministry, Luther Northwestern Theological School, 1989. "Wise Men Worship the King," Rev. Bryan Findlayson, Lectionary Bible Studies and Sermons, Pumpkin Cottage Ministry Resources. "Although the visit of the Magi images the Moses story, it primarily serves to demonstrate the fulfilment of scripture in Jesus' birth." "Seek the Lord," Larry Broding's Word-Sunday.Com: A Catholic Resource for This Sunday's Gospel. Adult Study, Children's Story, Family Activity, Support Materials. "Have you ever felt called to find an answer or go on a quest? What happened?" "Pope John Paul II and Prayer," Epiphany, Fr. Gerry Pierse, C.Ss.R., from Sundays Into Silence: Reflections on the Sunday Gospels in the Light of Christian Meditation. Claretian Publications. "The believer is often incapable of puzzling out God's plans and seeing his hand behind painful human history." "But beyond the pathos of infant death, Matthew focuses on the life of an infant-- an infant spared (at least for a time) from the point of sword or spear. The life of one babe predominates and that life finds itself inseparably meshed with the story of Israel." "When Hezekiah, king of the Jews, was delivered from a fatal illness, Merodach-baladan of Babylon sent emissaries with gifts. We could safely judge them less than honorable. Didn't they really come for political reasons? for a treaty perhaps designed to harass the Assyrians? Was there an element of intrigue? Did they wish to "spy out the land?" Hezekiah, victim of messianic delusion, parades before them the wealth of his house, just the stuff to attract the Babylonian eye. One hundred years later, according to the Lord's judgment, the Babylonians returned to cart off the treasures of David's house (cf. Isa. 39)." "Examining the text more closely, we notice that the exposition of Micah, pointing to Bethlehem as Messiah's birthplace, is not related to the Magi by the expected source, viz., the scribes. It is rather Herod, informed by the Jewish leaders, who transmits this information in secret. Again we have some sermon points that are possible. God requires that we consult special revelation to find the Christ, but he is not limited in how that revelation can be delivered. His sovereign power means he can make his enemies prophetic voices for the truth. Though this sounds like a pious addendum which does not constitute the central theme of the chapter, it is an observation with a striking similarity to the Balaam situation in Numbers 22-24." Environmental & earth-centered reflections, Rev Wanda Copeland, from the Episcopal Diocese of Minnesota Environmental Stewardship Commission. "In what ways does nature still acknowledge Jesus¹ birth? In the lengthening of days (coming of the light from the darkness, warming of the earth for those in the Northern Hemisphere.) The signs of welcome and rejoicing are many, if we but take the time to look." "The Story of the Other Wise Man," Henry Van Dyke, abridged for pulpit use by Carlos E. Wilton. Recommended articles from ATLAS, an online collection of religion and theology journals, are linked below. ATLAS Access options are available for academic institutions, alumni of selected theological schools, and clergy/church offices. nnotated list of "starting place" articles at ATLAS for this week's texts (includes direct links). Agourides, Savas, "The Birth of Jesus and the Herodian Dynasty: An Understanding of Matthew, Chapter 2," Greek Orthodox Theological Review, 1992. Bertram, Robert W., "An Epiphany Crossing -- Programming Matthew 2:1-12 for Readers Today," Currents in Theology and Mission, 1980. Brueggemann, Walter, "Off by Nine Miles," The Christian Century, 2001. Bruns, J. Edgar, "The Magi in Episode in Matthew 2," The Catholic Biblical Quarterly, 1961. Carter, Warren,"Between Text & Sermon, Matthew 2:1-12"Interpretation, 2013. Carter, Warren, "Matthew's Gospel: An Anti-Imperial/Imperial Reading," Currents in Theology and Mission, 2007. See entire issue of Currents in Theology and Mission 34, image focus on Matthew's gospel. El-Amin, Imam Plemon, "The Birth of Jesus in the Qur'an," Review & Expositor, 2007. Enuwosa, Joseph, "African Cultural Hermeneutics: Interpreting the New Testament in a Cultural Context," Black Theology, 2005. "Following the Star," collection of quotations, Christianity Today, 2004. Goetz, Ronald, "The Highest Knowledge," The Christian Century, 1983. Heater, Homer, Jr., "Matthew 2:6 and Its Old Testament Sources," Journal of the Evangelical Theological Society, 1983. Hockenbery, Jennifer, "The Gift of the Magi, Intercultural Conversation and Understanding, A Philosophical Meditation on Epiphany," Currents in Theology and Mission, 2008. Housley, Kathleen L., "The Magi," The Christian Century, 2001. Poetry. Lerch, Marilyn E., "Kneeling at the Feet of the Wise One," Brethren Life and Thought, 2005. Sermon. Maalouf, Tony T., "Were the Magi from Persia or Arabia?" Bibliotheca Sacra, 1999. McClaren, James S., "Jews and the Imperial Cult: From Augustus to Domitian," Journal for the Study of the New Testament, 2005. McGovern, Robert, "The Magi," The Christian Century, 1994. Poetry. Mork, Carol, "Revelation and Response: Matthean Texts for Christmas and Epiphany," Word & World, 1989. Nolland, John, "The Sources for Matthew 2:1-12," The Catholic Biblical Quarterly, 1998. O'Driscoll, Herbert, "Kingly Presence," The Christian Century, 2003. O'Kane, Martin, "The Artist as Reader of the Bible: Visual Exegesis and the Adoration of the Magi," Biblical Interpretation, 2005. Petrotta, A.J., "A Closer Look at Matt 2:6 and Its Old Testament Sources,"
and "An Even Closer Look at Matt 2:6 and Its Old Testament Sources," Journal of the Evangelical Theological Society, 1985 and 1990. Phipps, William E., "The Magi and Halley's Comet," Theology Today, 1986. Powell, Mark Allan, "Echoes of Jonah in the New Testament," Word & World, 2007. Powell, Mark Allan, "The Magi as Kings: An Adventure in Reader-Response Criticism," The Catholic Biblical Quarterly, 2000. Russell, Letty M., "Wise Woman Bearing Gifts," Cross Currents, 2003. Sappenfield, William J., "Known Beyond the Borders: Reflections on the Lectionary Readings for January," The Living Pulpit, 2007. Senior, Donald, C.P., "Expository Article: Matthew 2:1-12," Interpretation, 1992. Slemmons, Timothy M., "Matthew 2:1-12," Theology Today, 2002. Poetry. van Beek, Gus W., "Frankincense and Myrrh," Biblical Archaeologist, 1960. "The Troubling Star," the Rev. Maxwell Grant, Day 1, 2015. "The Light Within All Life," the Rev. Dr. John Philip Newell, Day 1, 2013. "The Main Thing," the Rev. Randy Calvo, Day 1, 2008. "Seeking," Dr. Dwight Gunter, Preacher's Magazine, 2007. Epiphany - 6 January 2006, James Mueller, Göttinger Predigten im Internet: Every Sunday Sermons based on the RCL by a team of Lutheran theologians/ pastors. "Come Home," the Rt. Rev. J. Neil Alexander, Day 1, 2002. "The Gift of the Magi," the Rev. Mark Sargent, Day 1. "Another Way Home," the Very Rev. Harry H. Pritchett, Day 1, 1996. "Grace," the Rev. Dr. Douglas Oldenbug, Day 1, 1996. "Discovering Your Own Gifts for the Christchild," "Exploding Light," "Shooting Stars," "Where Did Christmas Go?" Pastor Edward F. Markquart, Grace Lutheran Church, Seattle, Washington. "Neon Starburst," John Stevens, Dollar Store Children's Sermon, 2015. Worshiping with Children, Epiphany, Including children in the congregation's worship, using the Revised Common Lectionary, Carolyn C. Brown, 2013. "The Three Wisemen," Illustrating the Story (lessons, children's sermons), coloring pages, activity sheets, crafts, children's songs. MSSS Crafts. "Wise Men Come from the East to Worship Jesus," Sunday School Lessons: Family Bible Study, art projects, music, stories, etc. "Wise Men Worship Jesus," Jim Kerlin, childrensermons.com. "The Wise Men," children's study, puzzles, coloring sheet, etc. Higher Praise Christian Center. Wise Men Search for Jesus, sermons4kids.com. 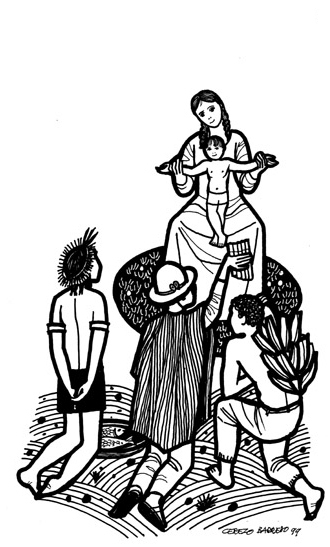 "A Feast with the Shepherds," from A Certain Jesus by Jose Ignacio and Maria Lopez Vigil. Ideal for catechetical and liturgical dramatization of today's gospel. Claretian Publications. "Angel Delight," Michael English, Milton Parish Church Drama Resources. Clip Art, Matthew 2:2, Matthew 2:2 #2, Matthew 2:11, Fr. Richard Lonsdale, Resources for Catholic Educators. Clip Art Images: Epiphany, Misioneros Del Sagrado Corazón en el Perú. Matthew 2:1-12, at Cerezo Barredo's weekly gospel illustration. Liberation emphasis. Images for this week's readings: Pitts Theology Library Digital Image Archive. Matthew 2:1-2, Matthew 2:2, Heartlight - Free Christian PowerPoint Backgrounds. “When Mary Hugged Her Newborn Son,” an original hymn by Carolyn Winfrey Gillette, celebrates Mary, the Shepherds and the Wise Men and asks "God, make us faithful, humble, wise, To know that Jesus changes lives." This hymn was commissioned by The Presbyterian Outlook Tune: TALLIS' CANON (8.8.8.8) (All Praise to Thee, My God, This Night). “Once Long Ago,” an original hymn by Carolyn Winfrey Gillette, celebrates the story of wise men and asks “"How can we honor Christ with what we bring? How can we now give presents to our king?" Tune: SANDON 10.4.10.4.10.10 (“God of Our Life”). Hymns with Scripture Allusions: Matthew 2:1, 2, 9. 10, 11. The Cyber Hymnal.